Price listed is for three embellishments. 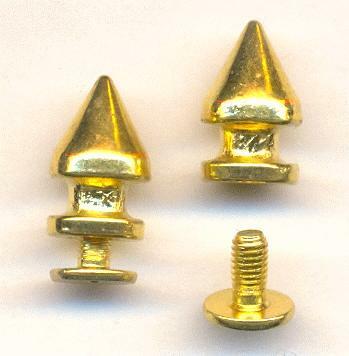 These are gold plated steel screw-on spikes. They are approximately 15mm tall with the screw in and 7mm wide. These are great for embellishing leather. These are great for embellishing leather. The threaded portion of the screw is about 2.75mm thick.